Spanish police have arrested top-ranking Catalonian officials, including Junior Economy Minister Josep Maria Jové, as Madrid launches a crackdown on Catalonia over the upcoming Independence referendum. Jové is a senior member of the Republican Left of Catalonia political party. He was detained following a Wednesday morning raid carried out by Spain’s Civil Guard, which has the authority of both the Interior and the Defence ministries. 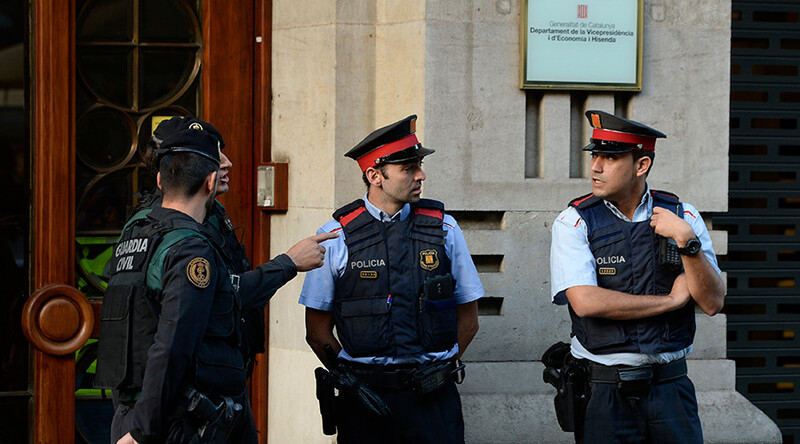 The Civil Guard conducted searches of the Catalonian government buildings. Catalonia is now “in a state of siege ”, Catalonia’s Minister of Labor, Social Affairs and Family Dolors Bassa said on Twitter, confirming that the Civil Guard has also entered her department. The president of Catalonia, Carles Puigdemont, accused the Spanish government of showing a "totalitarian attitude" by arresting Catalan officials, 20 Minutos reported. He also vowed to move forward with the referendum, despite warnings not to do so. Spain’s Guardia Civil, a military force charged with some police duties, has reportedly seized 10 million ballot papers intended to be used in Catalonia’s independence referendum on October 1. An image of the ballot papers was posted to the Twitter timeline of Spain’s Interior Minister Juan Ignacio Zoido on Tuesday. The tweet was subsequently retweeted by the Guardia Civil’s official Twitter account. In total 12 people, three of them from the Junqueras team, were arrested during the raid, El Pais newspaper cited police sources as saying. Among those detained are Josue Sallent Rivas from the Centre of Telecommunications and Information Technology, Xavier Puig Farré from the Office of Social Affairs and Josep Maria Salvat Tenesa from the Ministry of Economics and Finance. It is a matter for Catalans but the general rule is that those who support an occupying power against a liberation struggle are traitors. Earlier in September Catalonia’s Parliament passed a bill paving the way for an independence referendum to be held on October 1. However, the Spanish government considers the referendum illegal, and has suspended the vote pending a formal decision by Spain's Constitutional Court. The Spanish state prosecutor ordered a criminal investigation of 712 Catalan mayors for co-operating with the process. Catalonia previously held an independence referendum in 2014, which saw 80 percent of voters choose independence. Nevertheless, it was ruled unconstitutional by Madrid.